Merkur was a failed brand, but that can’t be blamed the Ford subsidiary’s two models, which were both hella hip in their own way. Let’s see if the price on today’s Nice Price or Crack Pipe Scorpio has it going your way. It’s tough to have a weird version of something when the regular version is typically considered to be pretty good. That was kind of the issue with yesterday’s admittedly extremely rare 1985 ‘just for export’ Jeep CJ10. As nice and as interesting as it was, there are still a ton of J10s and Scramblers out there that could be just about as lust-worthy. Pile on that a $32,500 price and things just fell apart for the reverse ex-pat Jeep, ending up with a 67-percent Crack Pipe loss. Back when AMC was mounting its attempt at conquering foreign markets with the Jeep, the Ford Motor Company was trying to do the exact reverse by launching a new brand in the U.S. that was to be made up exclusively of models from their European subsidiaries. That brand was Merkur and it was tied to the Mercury in both name (Merkur is Mercury in German) and in position as the models were spec’d and priced above their European Ford begetters. This wasn’t the first time Ford offered European products through their mid-tier Mercury brand. In the ‘70s they brought over and rebranded the Capri with modest success. Around the same time, a partnership with Alejandro de Tomaso saw Panteras sold and serviced out of Lincoln Mercury shops. But this was a whole new brand, and the cars it offered were particularly European in their presentation. Both were large-ish hatchbacks, which at a time was a body style that was shunned in the U.S. as many saw the form as being down-market. Another issue with the Merkur band was that name. Merker? Mayor car? Merkin? Mercury had long established itself as a staple in America’s bread basket, and midwesterners—even the dealership staff—had difficulty with the pronounciation. It’s Mair-koor by the way. Add to that the name’s lack of any provenance or cachet and the weakening U.S. dollar that spiraled prices ever higher and you had a recipe for failure. That’s a damn shame, because if you take one look at today’s 1988 Merkur Scorpio what you’ll see is a damn cool car. 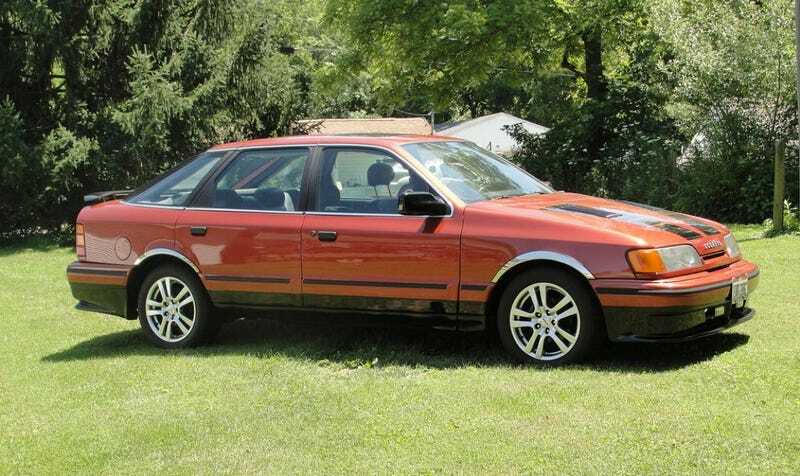 The Merkur Scorpio was big brother to the marque’s only other car, the European Sierra-based XR4Ti, and was intended to compete for sales against cars like the Audi 5000 and BMW 5-Series. The XR4Ti was offered only in a uniquely styled three-door coupe body, while the Scorpio arrived exclusively as four-door with a large hatch. Today it makes for a car that really stands out, but back then it looked a little too much like the far less expensive Sable, and that car had a trunk! Merkur only sold about 22,000 Scorpios in the U.S. over the course of its three-year model run. By my calculations, it appears that maybe 12 still remain. Most of those are rat traps. This one seems to have been lovingly maintained and even enhanced as evidenced by its chrome wheel arch trim, hood vents and expressive paint. The wheels are off a later Ford—Mustang, maybe?—but look right at home here. Some of the personalizations here are less successful, and I was purchasing the car I’d return the nose and hood to their original states. The ad notes that the car suffers no rust and only a single notable bullseye on one door. Paint is super shiny and that floating roof and large greenhouse are design elements that can still be appreciated. The interior is remarkable for its condition. I mean, this is the nicest looking Scorpio cabin I think I’ve ever seen. And I saw these cars when they were new. The leather seating surfaces look to be in perfect shape, and all the plastic trim appears to be accounted for. Hell, it even still has the pneumatic squeezers for the lumbar adjustment! The factory radio—which I believe is a Grundig—faces a wooden shift knob, the only non-factory bit in here. We don’t get any shots of the engine bay, but if we were so lucky we’d see a 144-horsepower, 2.9-litre edition of Ford’s long-serving Cologne V6. These engines have been around since 1965 and over the years have made their way into a ton of Ford products. That means parts shouldn’t be a problem. Other, Scorpio specific bits like glass and trim will be harder to find, but remember, Ford sold a ton of these in Europe and the Internet makes the continent feel like it’s right next door. Hello, Hans! The issues with the car include the personalizations. I think we can all agree that black paint on the hood and the SCORPIO badge are a bit too much. The other issues include a non-functioning odometer, frozen at 16,572 miles, and A/C that the seller says ‘needs work.’ On the plus side, the seller is willing to throw in with the deal a set of repair manuals and some sort of diagnostic tool in a box. The price? $2,800. Yep, that’s solidly why-not range, but then the Scorpio has never really been a why-not kind of car. A bit of a different drummer kind of car, and it needs a likeminded owner to really appreciate its idiosyncrasies. Could you be that loose screw? Would you pay $2,800 to find out? Dayton, OH Craigslist, or go here if the ad disappears. Which Of These European Touring Car Legends Would You Take Home?